At Christopher Columbus High School, tuition is kept as low as possible. In fact, our tuition is one of the lowest amongst the private schools in the Miami area. This is because we only raise tuition to cover the operational expenses of the school. All funds needed for building projects and improvements are raised solely through private donations and events. Our school would not have been able to expand and offer the quality educational programs that it does today if it weren’t for the generous support of our benefactors and donors. 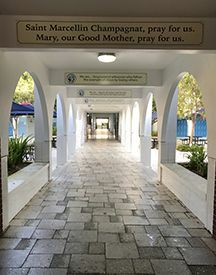 It is the mission of the Marist Brothers to provide a quality Catholic education to all students, regardless of their economic background. This is why in addition to keeping our tuition low we also provide financial aid to many needy families. By giving to Columbus you will help the school continue to fulfill its mission of offering a quality Catholic education in the best learning environment possible to a wide range of students. Each year, Christopher Columbus High School awards more than $1.5 million dollars in need-based financial aid.